Tanith Lee is a prolific writer of fantasy, though under that umbrella she has done everything from children’s books to science fiction to YA Romance (a teen and a robot). My first encounter was a serendipitous discovery of Night’s Master in a used book store near my high school, many years ago.Even at that young age, I was getting weary of fantasy novels featuring a gifted person leaving their pseudo-medieval village to discover their destiny and save the kingdom. Night’s Master was refreshingly different. No one knows then what Azhrarn said or did. Perhaps it was so fearful that even writing it down, the words would scorch holes through the paper and those who read them go blind. 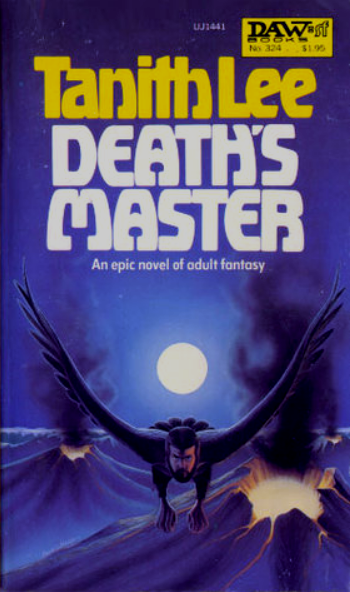 Death’s Master is the second in what eventually would become five “Tales of the Flat Earth.” The last three are more traditional ‘books in a series,’ but Death’s Master reads well as a stand alone novel, and is less episodic than Night’s Master. As with Night’s Master, Death’s Master concerns a demon lord, but unlike the playful trickster of the night, this lord has the solemn duty of collecting the dead. The story follows two boys, one conceived with the assistance of Death, and not always a boy, and one made invulnerable to every harm (like Achilles, but without the unprotected heel). For a time boys are together, but the love does not last. They become enemies, sometime pawns of the lords of night and death, and oppose each other while centuries pass and kingdoms rise and fall. Other characters include a queen who sacrifices herself for her kingdom, several people who bargain with Death for various reasons, and a woman who seeks a hero to love. Love is presented in many forms, though physical acts are never described beyond fanciful metaphors. A fantasy setting allows a lot of play with gender roles and sexual symbolism, and Lee takes full advantage of this. (Among her works are two YA SF novels where teenagers routinely kill themselves to get new bodies, and may choose male or female.) Lee’s use of strong female characters elevates her work above much of the sword and sorcery genre. Bargains do not always work out planned, for either party, and magic can be unreliable. In among the spells, ambitions, and deceit a few messages emerge: Greed is bad, hate is bad, love is good, be careful what you wish for, and some fates are unavoidable. In the end, Death has the sought after company, but not how or where it was expected. As for the claim that Death does not love, while that may be true in the physical sense, the final image of the book is that of a couple quietly resting together. They have accepted their fates, and find comfort and strength in the simple presence of each other. Looks like love to me.